It’s been a big week to talk about TV endings. So, now that The Bridge’s unique first season has come to a close, let’s talk about beginnings. Deciding when and how to start your story is much more critical to a television show than the way you decide to finish it. 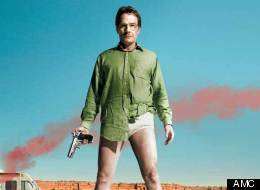 (That’s why Walter White’s tightie-whities will always be more iconic than Mr. Lambert’s keychain of doom. And deservedly so!) Audiences need to be quickly hooked, network concerns need to be nimbly ameliorated. There are actors to coddle, themes to establish, purposes to declare. A baby show may appear to have its whole life ahead of it, but prenatal decision-making can go a long way toward determining whether that life will be long or short. On a micro level, The Bridge aced this test. The pilot and subsequent establishing episodes were fascinating and deeply nuanced. It was a show that appeared to be in control of all the little things that can add up to TV greatness: compelling leads, interesting supporting characters, and a clean, distinct point of view. Rather than lose itself into the fictional abstraction of popular entertainment tropes — the Mafia, say, or a lush period piece — The Bridge was set resolutely in the here and now. Its vision of Mexico, though far from perfect, was refreshing. The country wasn’t presented as ominously opaque, unknowable other. Rather, it was an equal partner subsumed in the shady crosscurrents of culture, crime, immigration, and politics that have come to define the border in the 21st century. Like all truly great series, The Bridge presented a world with its own rhythms, its own language, and its own stakes, and did so without apology. The pilot wasn’t a road map. It was an invitation. On a macro level, though, things were less tidy. As he explained to me in our podcast conversation, Elwood Reid — the writer who, along with Meredith Stiehm, adapted and ran The Bridge — knew that a twisty, complex societal drama set equally in El Paso and Ciudad Juárez was a tough sell, particularly in basic cable’s post–Walking Dead ratings frenzy. The idea of launching the show without including the hooky serial-killer plot from Broen, the original Danish series from which The Bridge was adapted, was, apparently, “a non-starter.” So after beginning with such promise, The Bridge slowly tacked back toward convention. By midseason, a show that had trafficked in subtlety was completely in thrall to David Tate, a beard-twirling, villainous mastermind whose overly busy, vengeful scheming threatened to stamp out all the writers’ good work and all of the audience’s goodwill. What’s incredible about all of this is that the showrunners themselves seemed well aware of the bind they were in. The serial-killer story seemed like an obligation, not an artistic choice. Because of this, the wonderful weirdness at the margins of The Bridge, though minimized during Tate’s reign of errors, was never extinguished. And Reid and Stiehm made the radical decision to essentially end their first season with two episodes remaining, as if to say this: Look, that’s done! Here’s the show we really want you to watch! It was wildly presumptuous — what if FX hadn’t green-lit the second season that the show had essentially already begun in earnest? It took guts to use part of the guaranteed present to make such a big bet on an unpromised future. TV is generally too fragile and too expensive an enterprise to allow for this sort of pre-hatch chicken counting. But it worked. The result was a debut season like none I’ve ever experienced, one that whipsawed from wonderful to awful and back again. In all the time I’ve been watching TV, as a critic and as a fan, I don’t think I’ve ever been so close to throwing up my hands in disgust only to use them to applaud instead. Last night’s season finale, “The Crazy Place,” not only justified my initial investment in the show and my subsequent patience, it made me more bullish than ever on The Bridge’s future. A second season devoted to the real-life femicides of Juárez, to our tarnished angels Marco and Sonya trying their best to find some glimmer of made-up sense in the incomprehensible murk of reality? That feels like the show The Bridge was meant to be all along. But was it worth the bumpy journey it took to get here? It’s tough to say. “The Crazy Place” felt like a fresh start but it was far from a reboot. The delicate relationships between our cross-border cops, between Daniel and Adriana, between Steven Linder and his boots, have all been forged in the crucible of this trying season. The scope of what next season entails and the subtlety required to accomplish even a fraction of it demands experience and great care. It’s the sort of multi-tiered storytelling that can only be accomplished free from the grinding gears of exposition that are unavoidable in first seasons. The concern is that The Bridge’s characters aren’t the only ones who have been bruised. It’s a buyers’ market for quality television these days, and The Bridge’s growing pains may have cost it dearly. Even if this current version of the series has finally aligned showrunners and show watchers, it might be hard to convince those who jumped off The Bridge to swim back to shore and give it another shot. For all the talk of TV’s increased IQ, it’s still not a medium designed to make us eat our vegetables before giving us our rewarding dessert. What’s particularly odd about The Bridge is the David Tate story was expressly designed to be the brownie, not the broccoli. Who would have thought it would end up as the most unappetizing part of the meal? But the time for me to prescribe fixes for The Bridge has come to an end. This has been a fascinating ride, filled with remarkable performances and even more noteworthy ideas about what a smart TV drama looks like in 2013, and how it sometimes has to play dumb to survive. What matters most is that the skeptics — and KRS-One — have been proven wrong. The Bridge is not over. I’m very much looking forward to discovering what’s on the other side.